Diesel’s Uncholy Cocktail has made quite a buzz all over cigartown as of late. Not only does the fact that AJ Fernandez (creator of the Man O’ War series) concocted this elegant stick demand mass attention, but seeing these advertised as low as $2.50 a stick online could capture anyones attention. I didn’t want to jump all over these sticks for fear of being let down, so I took a backseat and just listened to what a few of my colleagues had to say about it first. After hearing nothing but great things from both Stogie Review, and Nice Tight Ash I decided to jump on the bandwagon and experience this one for myself. The Good Stuff: I wasn’t able to pull out a whole lot of interesting information on this cigar outside of the straight backs. As stated before the Diesel was produced by the master mind Abdel “AJ” Fernandez, creator of the most intense of blends including the Man O’ War, Rocky Patel’s Fusion, Padilla Habano, Indian Tabac 10th Anniversary, and Sol Cubano Cuban Cabinet. 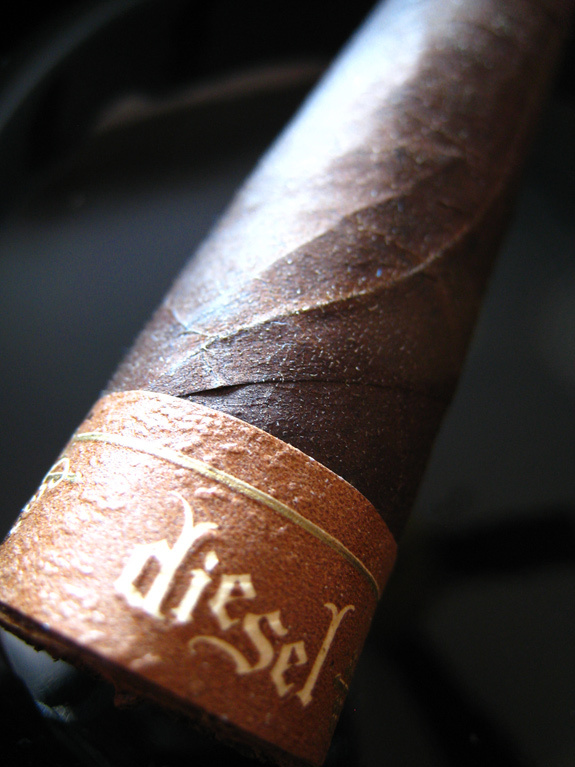 The Diesel is only produced in one vitola, the Torpedo and consists of filler tobaccos from Jalapa, Condega and EsteliNicaragua wrapped with a dark Pennsylvania Broadleaf wrapper. 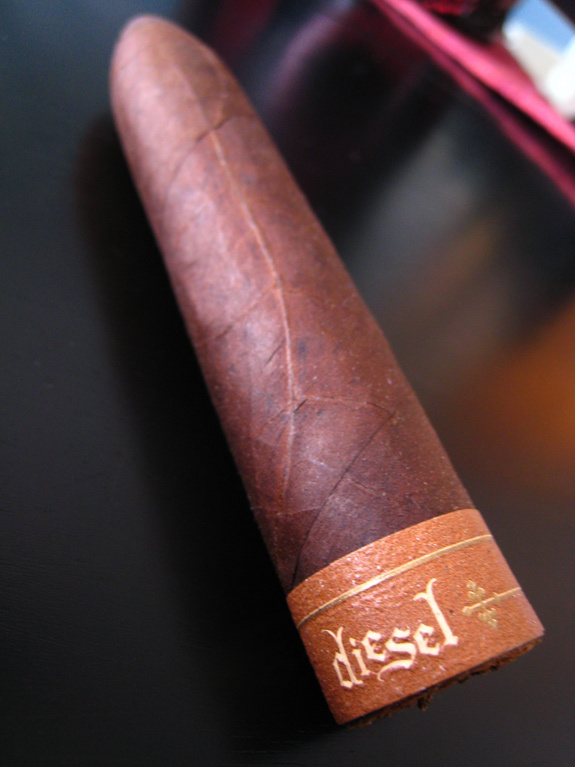 Prelight: The Diesel’s wrapper is incredibly silky and oily, even to the touch. The wrapper is very toothy and sports a very dark chocolate-like consistency. There was one partial wrap in mine cigar that was about 4 shades lighter than the rest of the cigar, but outside of that the colors were strictly uniform. The Diesel carries a long torpedo shaped cap that tapers off into a thick body. 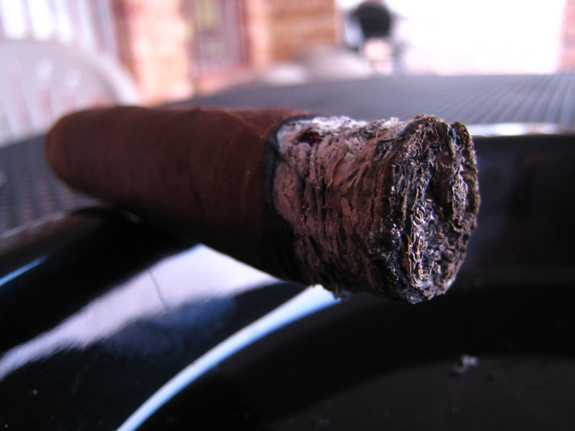 The portion where the head meets the cap of the cigar seemed to be just a tad thicker than the rest of the cigar so I actually had to pull out the ring gauge to find that this was just an optical illusion. 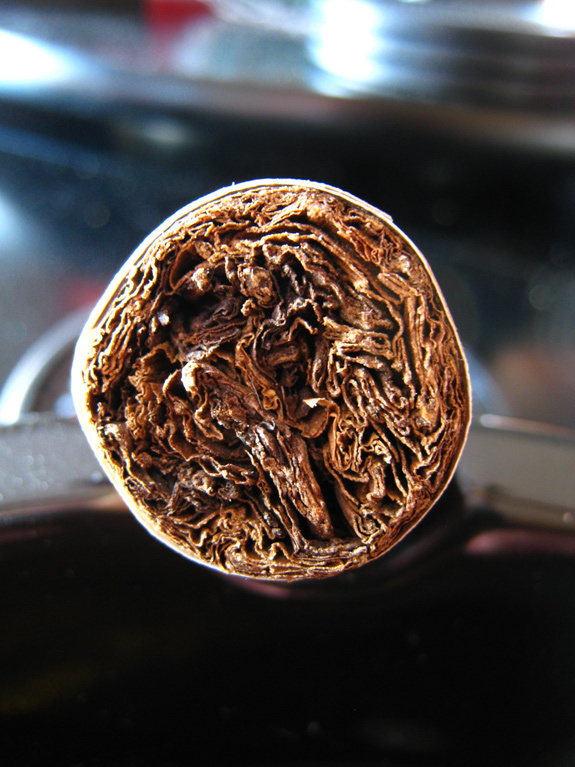 Many small veins can be found scattered across the Diesel’s wrapper along with one larger, thick vein running almost the entire length of the cigar. The Diesel is very firm to the touch and only had one minor soft spot towards the cap, but it shouldn’t be anything to worry about. The Diesel smells very barnyard, and not the least bit enticing. But we all know that doesn’t mean it won’t be a remarkable experience. Most cigars don’t smell good. That’s why we don’t use them as air fresheners. 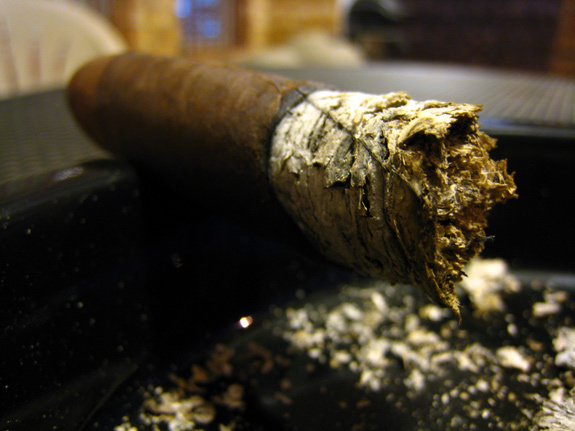 Outside of the barnyard almost manure smell one could pull hay, and soft leather from the foot of this cigar. 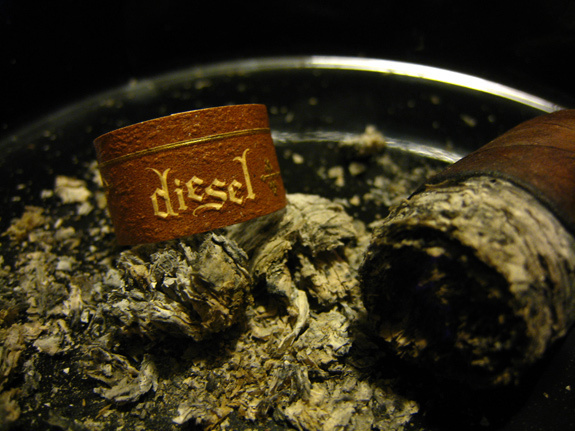 The foot of the Diesel is garnished with an almost midevil leather looking band with the words “diesel” embossed in it twice around. The band had little glue, and I was able to slide it right off withalmost no effort. The cold draw produced similar hay and leather tastes, with a hint of spice. First Smoke: The Diesel lit up extremely easy under my triple flame butane torch. The flavors were extremely abundant and intensely bold. I was able to decipher quite a bit of a cedar taste, with hints of black cherry, leather, coffee and just enough pepper to tickle my lips and the tip of my tongue. The draw itself was a bit tight and surprised me by how much flavor and smoke it produced. The smoke was a thick grey, and smelled off cedar and barnyard. This isn’t something you’d want to light up around a lot of people who aren’t into cigar smoking. The Diesel didn’t produce a lot of stationary smoke at all. The burnline on the diesel was razor thin and started slightly wavy but did a good job correcting itself early in producing a nice, thick, well packed white and light grey ash. I was pretty surprised when my first ash only lasted about 3/4 of an inch before it decided to give way. Halfway There: So far so good. The Diesel’s flavors are holding pretty consistently. The pepper has just about dissipated as well as the raw coffee I was pulling from the diesel early on and they have been replaced by a smooth, milky aftertaste. This cigar is producing quite a bit of moisture in my mouthwhich is helping me cope withnot having a drink to pair it with. The nicotine is starting to take its toll on me as well. It’s not flooring me by any means, but after about 30 minutes of smoking once can feel the blood rush to his head once he stands up. I’m impressed with how slow this cigar is burning. I would be at two thirds in on similar vitolas. The burn line is getting a bit off track again as I pass the halfway point, but it seems to be just one problem area about an eighth of an inch wide. I don’t think I will have to touch it up, it’s isolated enough that it should begin to catch up with the rest of the burn. 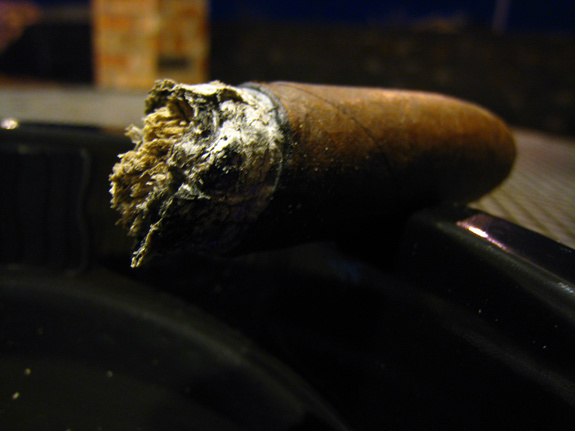 Finish: Toward the end of the cigar I began to taste much more of the coffee flavor that I was sure had vanquished earlier into the cigar. The cedar and sweetness of the black cherry are still center stage as well as the smooth aftertaste that developed. Another surprise if the fact that there is no harshness built up what so ever. The cigar is still just as smooth as it was when I first lit it up. I am feeling a bit more of a nicotine kick that expected, but that isn’t necessarily a bad thing. The burn line at this point is razor thin, and dead on without any need to touch it up. In total it took me almost 2 hours to finish this cigar. Overview:Diesel? I’ll take it.. for $3 a stick? I’d buy a box, or two, hell even three. This cigar was just as much of a shocker as everyone is saying it is. From its bold flavors and perfect construction to its great body and extreme consistency. This is the perfect cigar for a medium bodied cigar smoker who wants to try something with a bit more punch, but not enough to knock them off their feet. Not only that but I would strongly recommend the Diesel to the most seasoned cigar smoker as and everyday/anyday offering. Needless to say, I was pleasantly surprised and the diesel has its home in my regular rotation. Great review, I’m dying to try these. Keep it up man. Great review Tony! I just dont like nicotine kicks so I doubt I will care for this too much. After saying that, I will end up trying 1 or so since you never know for yourself till you actually try it. Nice and spot on review. Couldn’t agree with you more. Its a fabulous cigar and at its steal of a price its an everyday kind of cigar. Thanks Jerry, for the read and the comment. My review doesn’t hold a candle to your 2010 glasses though :/ and lets not even get into the elf Jerrry. Wow, that’s a detailed review. Nice review. I agree with your assessment, not a spectacular cigar, but a great cigar for under $3. I’ll have to give it another try. I smoked 2 and they were really overpowering. I never got the coffee or other flavors. Lots of cedar and harshness. I like a full bodied smoke, but this was just too much for me. I’ve finally had a chance to start reading your reviews and have enjoyed them so far. That being said another intrigueing review. I’m looking forward to giving these a try. 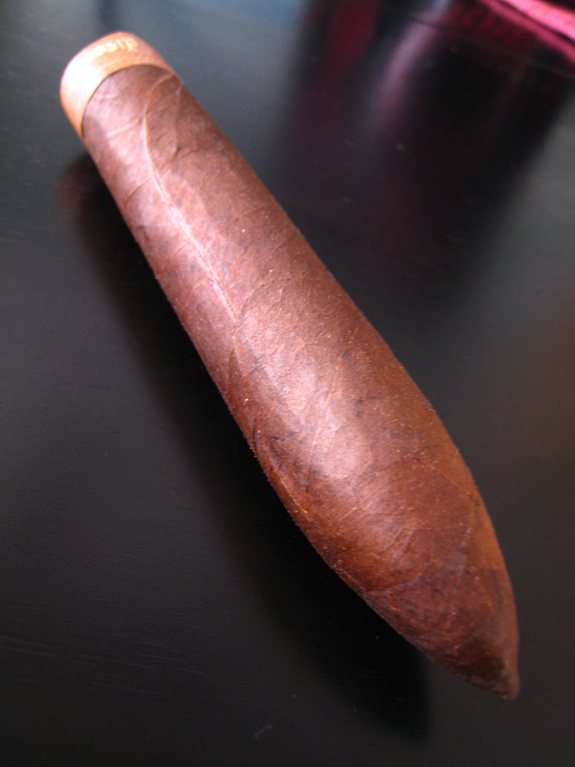 I really enjoy the medium and full bodied cigars and look forward to trying new cigars that fit that mold. Keith, thanks for the read bro! Def, a high quality value stick. Mr. Ron, they are a bit on the bold side, but work em in there! JT, Thanks for the kind words! You keep reading and I’ll keep writing! Dude, I just smoked one of these and it seriously tasted like it was dipped in Diesel for the last third. WTF? I’ve smoked hundreds of the Diesel Unholy Cocktail Torpedo cigars. My favorite. You can’t beat the price/quality. I buy them by the box and smoke 2 to 3 per day.